Participants in the consultations with cacao industry stakeholders, including representatives from the Toledo Cacao Growers Association, Maya Mountain Cacao, the Directorate General for Trade in Belize, and consultants from Marc Francis Ramsay & Company (now RamsaySmith). Belize is in the process of drafting the first post-CARIFORUM/EU Economic Partnership Agreement (EPA) Geographical Indications Bill in the CARIFORUM region, with unique provisions that the government is hoping will boost agriculture, manufacturing and handicrafts exports from Belize while providing greater protection for EU/CARIFORM GIs. A geographical indication is an indication which identifies a good as originating in the territory of a country, or a region or locality in that territory, where a given quality, reputation or other characteristic of the good is essentially attributable to its geographical origin. A popular example from the region is “Blue Mountain Coffee”. Article 145 of the EPA between the European Community and CARIFORUM States requires states parties to implement a sui generis system of protection for Geographical Indications (GIs). The deadline for implementation by all CARIFORUM members was January 1, 2014. The Bill was also drafted in conformity with the requirements in the Paris Convention, the 1994 Agreement on Trade Related Aspects of Intellectual Property Rights (“TRIPS”), and the Revised Treaty of Chaguaramas (RTC) obligation to adopt and enforce measures to protect intellectual property rights and to harmonize its laws and administrative practices in respect of these rights with other CARICOM Member States. The unique portions of the Bill include a special level of protection for not only wines and spirits but also the protected names for goods and handicrafts in EC/CARIFORUM states, protection against internet use that constitutes an act of unfair competition or infringing use and contributes to usurpation in bad faith, indefinite registration renewable every 10 years, non-custodial criminal penalties for infringing use, a tough custodial sentence for the intentional falsification of the register; the power of the court to order the delivery up oor disposal of infringing goods, the power of the court to cancel or transfer to an interested party an infringing internet domain name, and restrictions on the importation of infringing goods. The draft Bill was the focus of in-country consultations amongst the government, private sector stakeholders, and consultants from Jamaican law firm Marc Francis Ramsay & Company between November 30 and December 4 in Belmopan, Punta Gorda, and Belize City in Belize. Participants included the Ministry of Economic Development, Petroleum, Investment, Trade and Commerce; Directorate General of Foreign Trade (DGFT); Beltraide; The Belize Intellectual Property Office (BELIPO); The Bureau of Standards; The Solicitor General’s Office; Ministry of Agriculture; The Belize Society of Composers, Authors and Publishers (BSCAP); The Toledo Cacao Growers Association; Maya Mountain Cacao; and The Inter-American Institute for Cooperation on Agriculture (IICA). The discussions focused on the development of potential Belizean Gis, including organic Toledo Mayan Cacao: a valuable export product with an ancient history of being farmed by Mayans using traditional methods in the special climate of southern Belize. The participants concluded that the Bill, and IP legislation in general, has the potential to increase the value of unique Belizean goods, and in turn, increase exports. The Director General of Foreign Trade Dr. Leroy Almendarez stated that he is aiming to have the Bill passed in early 2016. 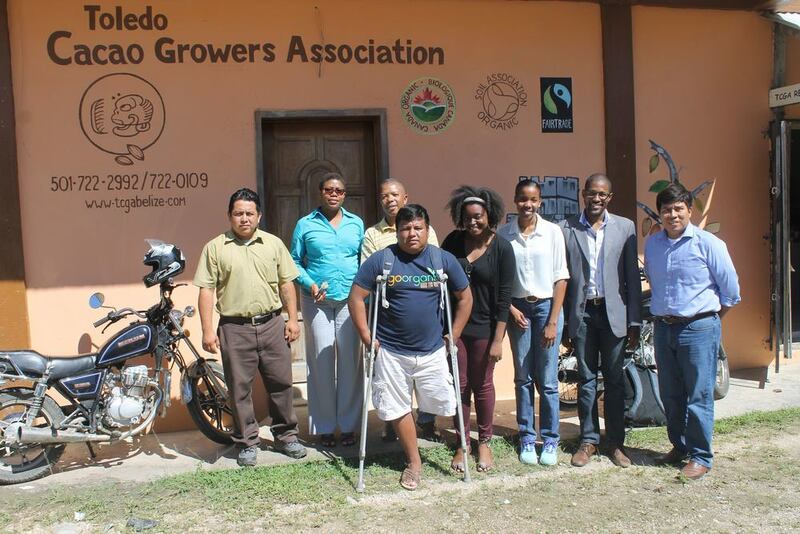 In the interim, BELIPO, DGFT and Beltraide plan to embark on a communications campaign within Belize surrounding not only the GI Bill but also other types of IP legislation, and to assist producers, manufacturers and traders with capacity building, beginning with the Toledo Mayan Cacao producers. Belize’s seriousness about implementing EPA compliant GI legislation is commendable. The small economies of the region require purposeful marketing in order to capitalise on their greatest assets: culture, people, climate and landscape.